What's it like to drive an EV? An electric vehicle drives like a gasoline-powered car in every respect, except that it's smoother and quieter. When slowing or braking, kinetic energy is recovered and put back into the batteries, thereby extending the range and reducing brake wear. A 2003 US Department of Transportation survey (PDF) found that 78% of Americans drive less than 40 miles a day. Nearly all driving is under 200 miles per day. EVs produced by GM, Toyota, and Honda in the late 1990's all got around 100 miles per charge using NiMH batteries. The Tesla Roadster is EPA rated at 244 miles per charge using more modern lithium ion batteries. It's easy to satisfy the daily needs of nearly all drivers with current battery technology, especially if the car isn't burdened by carrying around the dead weight of a gasoline engine. EVs have the ability to travel at freeway speeds. The Toyota RAV4-EV is electronically limited to 79 mph. The Tesla Roadster has a top speed of 125 mph. Just like your cell phone, it takes a few seconds of effort to plug it in at night and unplug it in the morning. Most people don't even know how long it takes their cell phone to charge, they just know it will be fully charged in the morning. It's the same experience with an EV. EV charge times are generally around four to six hours to charge a fully depleted battery, and much less than that most of the time when only a portion of the battery charge gets used. Most modern battery types are best kept fully or mostly charged. So, the best practice is to plug in the vehicle every night. In exchange for a few seconds of effort each night, you get to stop making trips to the gas station. There's no waiting in line, no breathing in carcinogenic fumes, and no hassling with credit card readers. After a few weeks of driving an EV, going to the gas station seems like an intolerable nuisance. Given sufficient range and reasonable charge times, the charge time is only an issue for road trips. There are other solutions to the road trip problem -- like owning a second car or renting a gas/electric hybrid for the few times you really need more range. There is currently no infrastructure for fast-charging stations, but it's pretty easy for that business to develop as EVs start appearing on the road. An electric vehicle has 1/10 the number of parts of a gas car. Most of the parts that require maintenance on your car are gone from an EV: engine, oil and filter, muffler, catalytic converter, and transmission. Brakes wear out less quickly due to regenerative braking. The battery pack and electric motor require no maintenance. So the biggest maintenance issues are washer fluid, wiper blades, and normal tire care. How much does an EV cost? Low-production EVs are more expensive than the mass-produced gas vehicles built by giant corporations that have been perfecting the technology and manufacturing process for 100 years. The cost of gas vehicles is also artificially low because the buyers don't have to pay for the damage done to the atmosphere; it's great to not have to pay for dumping your trash! Electric vehicles are expensive at the moment, but that will change -- the same way it did for TVs, VCRs, computers, cellular phones, and numerous other electronic devices. New technological innovation is costly and requires a non-trivial amount of research and experimentation before it is ready for "mass market." The early adopters of these items recognize the limitations of early models, but are willing to accept some shortcomings in exchange for getting their hands on exciting new technology. Those initial consumers help fund the product development, which can then advance from high-cost, low-volume production to a more streamlined and cost-efficient production. Consider cellular phones. Here is a picture of our first cell phone, circa 1990, next to a more modern StarTAC. Our first phone was large, heavy, and had a pretty limited coverage area since there were many fewer cell towers than we've come to expect today. It cost a "mere" $350, down from the thousand-dollar range of the first cell phones. 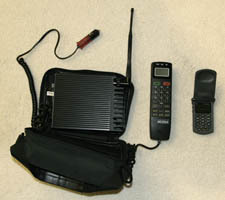 In 1996, Motorola released the StarTAC, a lightweight, compact cell phone -- although still expensive. Now, in 2008, companies are giving away cell phones, just about everyone has one (including kids), and they're treated like a basic utility. There are two things to consider when looking at a vehicle's efficiency: energy use and emissions. Here is an efficiency analysis comparing electric vehicles to gas-powered vehicles. The internal combustion engine (ICE) used to power vehicles is inherently inefficient with a narrow gap where it can generate significant torque and operate efficiently. That's why ICE vehicles have transmissions. Electric motors, especially AC induction and brushless DC motors, can be far more efficient and deliver torque over a much broader RPM range, and all without the complexity and maintenance issues of a transmission. Both power plants and electric motors are more efficient than ICE technology, both in terms of miles per unit energy and miles per unit CO2 production. Doesn't an EV just move the energy use and pollution to the power plant? Even when powered from today's electrical grid, which is heavy in coal and natural gas plants, driving an EV will reduce nearly all types of pollution, including greenhouse gasses and the emissions that cause smog. When powered from clean, renewable resources, driving an EV creates no pollution either directly or indirectly. Even with energy loss at the power plant, transmission lines, and charger, an electric vehicle uses less than half the energy of a 50 mpg hybrid like the Toyota Prius or Honda Insight. In terms of CO2 emissions, if electricity is generated from renewable sources like hydro, solar, or wind, zero emissions are created when charging an electric vehicle. Even in the worst case when using coal-fired electrical plants, producing the electricity to charge an EV creates less carbon emissions than the average US passenger vehicle (28.2 mpg equivalent vs. 22.4 mpg in 2006). Fortunately, coal isn't the only source of electricity in the US and is the predominate source in only a couple of regions. Using the average for the US grid, in terms of CO2 emissions, an EV causes CO2 emissions equivalent to 44.2 mpg. Charging off the west coast average grid, EVs are eqivaluent to 142.9 mpg. As the electrical grid gets cleaner, so do all electric vehicles on the road, while gas vehicles get dirtier and less efficient with age. Here's a nice summary of the environmental benefits of electric vehicles (PDF) from the Department of Energy. Here's a Department of Energy study which found that replacing gasoline vehicles with electric vehicles using today's grid would reduce overall pollution. Will charging EVs strain our electrical grid? Our electric grid is designed to accommodate the highest peak load which typically occurs on hot summer days when air conditioning puts high demands on the grid. A recent study funded by the DOE found that the grid has enough unused capacity to charge 190 million EVs during off-peak hours. It we can figure out how to get the coffee maker to come on before we wake up in the morning, we can get our EVs to charge at night without having to manage it by running to the garage and plugging it in at bed time. EVs could actually help the grid by charging at night at low electric rates and then selling their excess charge back to the grid during peak hours. Just tell your car it's OK to sell back to the grid as long as the battery is kept charged enough to satisfy your expected range needs. EVs also have the advantage of being as green as the grid. It's easier to take care of CO2 production at a power plant than it is to change the technology of the thousands of vehicles that could be charged by that plant. What about the impact of producing and disposing of batteries? Different battery types have different issues. At least with the type of batteries being used in the current and upcoming production electric vehicles (lithium ion), the environmental impact of mining for materials, manufacturing the batteries, and eventually disposing of them is small compared to the reduction in impact by driving electric instead of gas. For example, see this research study. Regardless of battery chemistry, the materials in a depleted battery have a significant monetary value, yielding a strong incentive to recycle batteries rather than disposing of them. Oil extracted from the ground and turned into gasoline is burned and lost forever, but materials mined for batteries remain viable for recycling after the useful life of the battery. Watch the movie Who Killed the Electric Car?, which tells the story of the EVs made by the big auto makers starting in the late 1990's when forced to do so by the California Air Resources Board. ©1996-2019 Tom and Cathy Saxton. You may not copy or reproduce any content from this site without our consent.